Award Winning George’s Bloody Mary Mix is now available in a Mild version. We first reviewed George’s Bloody Mary Mix (original flavor) in our Bloody Mary Mix Roundup. We deemed George’s at that time to be the most authentic “Maryland Style” mixer of the bunch, while it was also the hottest of the group of 5 mixers. George’s new Mild version is at the other end of the heat scale. Very mild, yet still retaining George’s signature authentic flavors and overall taste profile. As much as we liked George’s Bloody Mary Mix original, it was too hot to be our everyday mixer. With the new Mild version, George’s has outdone itself. The Mild recipe is more of an everyday mixer. And who does’t drink Bloody Mary’s everyday? Well, you know what I mean. Taste Straight Up: This is a delicious tomato cocktail beverage all on its own. A fresh tomato flavor with a good dose of worcestershire sauce is followed by just a hint of horseradish. Sweet and savory, it really is a great base for your Bloody Mary. I mixed up 2 ounces of vodka with 6 ounces of George’s for my Bloody Mary this morning. It made a very tasty and satisfying drink. They’ve dialed back on the horseradish and hot sauce enough to make a milder version of their original. Perfect as is, or as an blank slate on which to build your own flavor profile into it. Either by adding more of your own horseradish, or even some other wilder ingredients such as steak sauce or BBQ sauce – or kick it up a bit with your own favorite hot sauce. Ingredients: water, tomato puree, worcestershire sauce (vinegar, molasses, water, sugar, onions, anchovies, salt, garlic, cloves, tamarind extract, natural flavorings, chile pepper extract), lemon juice concentrate, horseradish (distilled vinegar, water, soybean oil, salt, sodium metabisulfate), hot sauce (peppers, vinegar, salt, xanthan gum, benzoate of soda), spices, celery salt. George’s Bloody Mary Mix is sold all over Maryland, and into Virginia, Delaware and New Jersey. If you can’t find it locally, visit GeorgesMixes.com to order directly from them. It’s also available online at Peppers.com and at the Peppers Store in Lewes, Delaware. great review guys. im not a bloody mary drinker would you recommend this even for me? Well, if you like tomato juice, then yes. 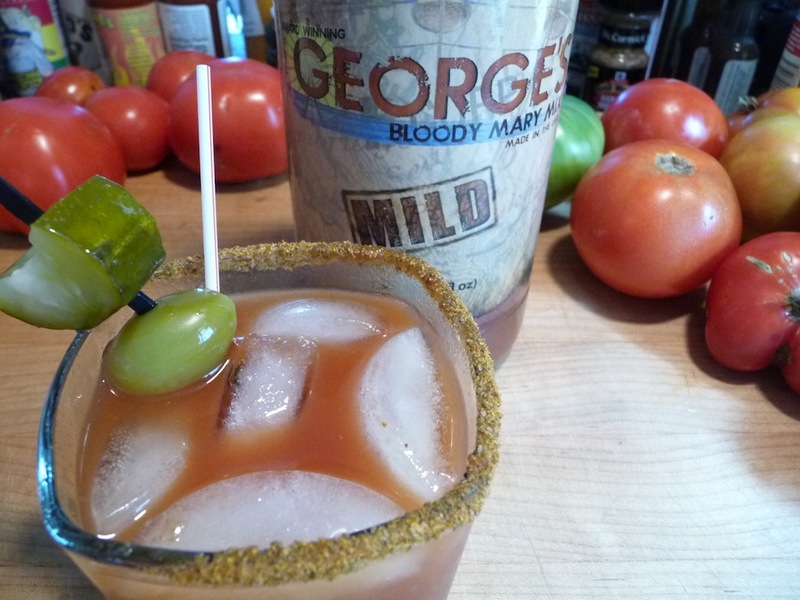 As I stated in the review, George’s Bloody Mary Mix Mild is delicious all on its own. Ubons BBQ made some fantastic bloody marys at Memphis in May. I don’t like bloody marys much but I loved the one they made me and drank the whole thing. So maybe I’m finally getting an appreciation for them, huh?